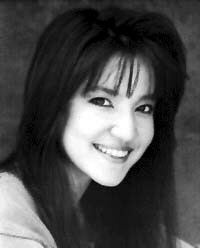 Behind Lauren Tom, Janice Kawaye (Born January 29, 1970, recently credited as Janice Roman Roku) is the second most prominent Asian-American voice actress in the business. Her first major roles came as Gi of Captain Planet and the Planeteers and Keiko of Potsworth & Company. She dropped off the face of the Earth for the next decade or so before resurfacing as the titular character of My Life as a Teenage Robot, Ami Onuki on Hi Hi Puffy AmiYumi, and the two Chin twins on Class of 3000. Outside of cartoons, she's dubbed anime as Shizuku in Hunter × Hunter and Yuzu Kurosaki in Bleach, which coincidentally features her Teenage Robot co-star Quinton Flynn. In video games, she's played against type as the sadistic villainess Alice in Tales of Symphonia: Dawn of the New World, though taking over for Tara Strong as Presea was a bit closer to her usual roles as sweet Genki Girls. Being Japanese-American, she's the inversion of Surprisingly Good English; she speaks Japanese very fluently, as she demonstrated on Young Justice as a character who spoke solely Japanese. She and Keone Young have also taught Grey DeLisle Japanese through their collective experience on Hi Hi Puffy AmiYumi. Cocoa Yazawa in Love Live! Kioko and Julia in All Grown Up! Aki on Be Cool, Scooby-Doo!